Another treat today courtesy of the fabulous mlisi39. This time he reviews the quintessential book on Brazilian football. I must say that he has fantastic taste in books, even if reading about them is costing me a fortune. Enjoy! So last summer I decided that I was going to buy as many books about football around the world as I could find or afford. I scoured many websites, consulted a ton of lists, made one giant order from Amazon and now I currently have 21 football-centric books sitting on my desk. I started off in my favorite footballing country, Italy, and my most recent foray took me to Brazil… home of Carnival, Bossa Nova and of course Futebol. Everywhere I looked, everyone agrees that the definitive book on Brazilian football is Futebol by Alex Bellos. From Tim Vickery to the guy down the street, everyone agrees that this is the one to read. Now? I agree. First of all, let me tell you that not only is this book about football in Brazil, but it is more like a cultural primer as to the how’s and why’s of Brazilian society and how football is interwoven into that society on almost every level. Why do some people live where they live? Football. Why have some towns risen while others have nearly disappeared from the map entirely? Football. What shapes the hopes and dreams of kids across Brazil both rich and poor? Football. Who can be your most powerful ally in politics? Football. How does a Brazilian end up moving to Iceland, marrying an Icelander and staying beyond his playing days? FOOTBALL! FOOTBALL! FOOTBALL! This is not to say that Bellows’ book is all about football. It does of course have a glossary of facts and results concerning the national team and all the club teams in Brazil. 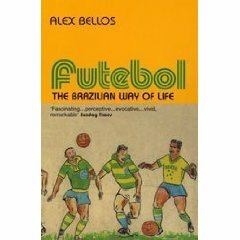 But, Bellows also manages to keep an even balance between dissecting the history of Brazilian football and explaining how that history has helped to shape a nation and its society. He has to though, because the history of the country and the history of football in Brazil mirror each other from the very beginning to the present day. A quick fact: Brazil was founded in 1899 and its first state championships were organized in 1902. The point? Brazil is a very young country and football has been at its core from the very beginning. Separating the two is all but impossible. My favorite part, the part that stood out to me the most, was the final chapter about the one and only Socrates. With his death recently, it was even more profound. 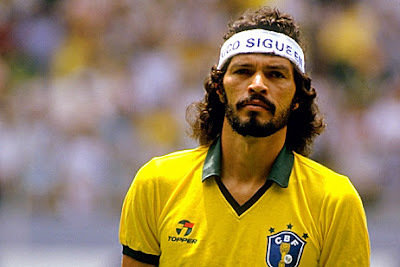 He was not only a footballer, but a politician, activist and emissary to the rest of the world. A Renaissance man in every sense of the word. I didn’t know much about him before reading this book, and it left me wanting more. He’ll always be known and remembered as a footballer, but like the country he represented, there was so much more. I can only hope that we see an English biography of him in the near future. The footballer, man, and legend. Futebol is a fascinating collection of anecdotes from fans, players, coaches, owners and towns people from all over Brazil. You really do get the idea that almost nothing goes on in Brazil without football affecting things in one way or another. It’s no wonder that footballers from Brazil have played in every corner of the world. One would think that many people in Brazil might identify themselves as Footballer before they identify themselves as Brazilian. Cheers and thanks again for the space Elaine. Thank you, Michael for another great book review! For more from Michael, check out this post and this book review.